Cider CARRAL EXTRA in cuba 6 months and one year in the bottle 7% vol. in cuba 6 months and one year in the bottle. Very balanced, dry cider and carbonated touches. 7% alcohol Vol. advisable with starters and fish. This cider is recommended to serve fresh, between 8 and 10 degrees of temperature, to obtain your optimum level of flavor. cider "extra" of 7% Vol. 75 cl bottle. CIDER SELECT CARRAL 37 cl. 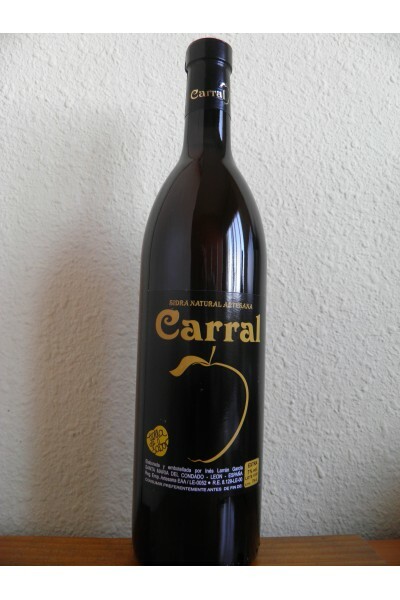 CIDER Extra CARRAL 37 cl. All Products León - Spain, store where you can buy online the best selection of wines Tierra de León, traditional meats: sausage, jerky, tongue, pork, cheese plus prefabricated, preserves, candy ... all made in the traditional way.